Oficially, the monsoon covered the entire country by July 19. The rain, in fact, was above normal. But it was not of much help to the farmers of Anandgaon, a drought-stricken village in Maharashtra’s Beed district, who had, on July 14, filed an FIR against the India Meteorological Department (IMD), blaming the country’s premier weather forecasting agency for huge financial losses. The FIR was as much a comment on IMD’S prediction capability as it was on the performance of Pradhan Mantri Fasal Bima Yojana (PMFBY), India’s ambitious crop insurance scheme, running into its second year. Trusting IMD’s April forecast about the monsoon being early, the farmers had sowed their kharif crop. But it later emerged that the early rains were not part of the monsoon; they were just pre-monsoon showers. By mid-July, farmers from across the country reported similar loss of seed, resources and effort because the monsoon took a three-week break. At this juncture, PMFBY should have come to farmers’ rescue. It did not. That IMD had bungled became clear when a nervous Devendra Fadnavis, Chief Minister of Maharashtra, issued an advisory on July 9, asking farmers to postpone sowing till July 20. But this was a month after farmers in Marathwada, a cultural region in central Maharashtra, had sown cotton, soybean, toor, moong and udid. “What was the point of an advisory when almost 85 per cent kharif sowing in our district was complete,” wonders Sandipan Badgire, a farmer from Latur district’s Sonwati village in Marathawada. Marathwada receives pre-monsoon showers in early June and the normal date of monsoon’s arrival is June 10. However, this year, Vidarbha and Marathwada received rains around May 29. 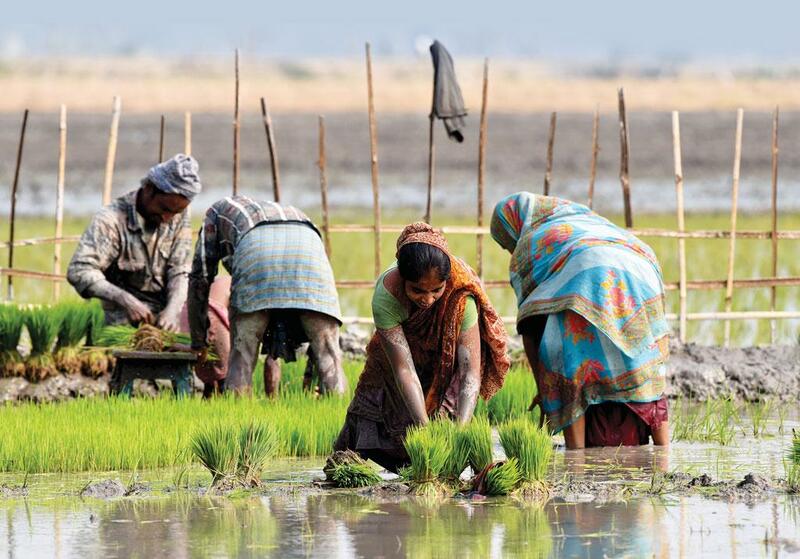 A look at the Agro Advisory Bulletins of IMD shows the agency’s lackadaisical approach. Though several parts of Marathwada and Vidarbha had not received rain after June 15, and the crops were still under threat, the Latur district Agro Advisory Bulletin for June 20 recommended “sowing of rainfed Bt cotton”, black gram and green gram. The June 30 advisory too recommended spraying potassium nitrate on crops to deal with water stress, and irrigating crops with sprinkler irrigation system. The advisories gave the impression that the monsoon was progressing well. But how did IMD get its forecasts wrong? Instead of observing and analysing wind patterns, it jumped the gun and declared monsoon’s arrival purely on the basis of precipitation received in Maharashtra and Madhya Pradesh between May 29 and June 15. This is how IMD’s blunder unfolded. It issued its first long range forecast (LRF) for the 2017 monsoon in mid-April, predicting the rainfall would be “normal”, 96-104 per cent of the long period average. This was reiterated in its second LRF released June 6. In the second week of June, it declared that the Arabian Sea arm of the Indian monsoon had arrived in Madhya Maharashtra, Marathwada and Vidarbha. Heavy showers in the region seemed to validate IMD’s inference; all three regions had received close to double the amount of rain they normally receive in the second week of June. But there was something strange about the rain patterns. The rain-sparse region of Marathwada received more precipitation than Madhya Maharashtra and North Interior Karnataka, which lie to its west and south respectively. Normally, the situation is reverse. Why? A look at the wind patterns explains the odd distribution—weak monsoonal winds never reached the interiors of Maharashtra. Instead of winds from the west-southwestern direction, as is required for the monsoon to prevail, winds that drove the heavy rains in Maharashtra in the first three weeks of June were haphazard. The rains were not monsoonal to begin with. Monsoonal conditions took form in inner Maharashtra only in the fourth week of June. Neither Marathwada nor Vidarbha have enjoyed rains since, with both regions registering deficits of over 60 per cent by July 13. “Strong monsoon depends on strong mon-soonal winds even in the upper reaches of the atmosphere and not just close to the surface. This year, during the initial period of rains, the higher winds did not support the progress of the monsoon and the stormy weather was a result of the friction between different layers of winds flowing in different directions. Subsequently, we have seen a dry period follow this period of rain in Maharashtra. While the rainfall appears normal, the number of rainy days is much less than normal,” explains Rajesh Kapadia, an independent weather forecaster based in Mumbai. Rains have, in fact, dried up all over the southern peninsula; all eight sub-divisions of the region (excluding Lakshadweep and Andaman & Nicobar) have registered deficit rainfall for the first two weeks of July. Well into the second week of July, monsoonal winds were yet to cover the entire Indian landmass—an event that normally transpires in early July. Despite this, northwestern states, the last part of the country to receive the monsoon, have recorded precipitation levels much above normal. “The June and early-July rains in Punjab and other parts of northwest India were pre-monsoonal showers caused by western disturbances. That is why the rainfall was on the heavier side in this region,” says Sathi Devi, scientist at IMD’s National Weather Forecasting Centre (NWFC). This, in fact, seems to be true for most of the country. A week-by-week analysis of rainfall shows that 19 of India’s 28 meteorological sub-divisions deemed to have received “normal” rainfall by July 13 have done so mainly by the virtue of short spells of extreme rain rather than sustained and uniform rain characteristic of a strong monsoon. Despite 80-90 per cent of the country having received rains, about a fourth of the districts (mainly from eastern, central and southern India) have reported a rainfall deficit of over 20 per cent in mid-July. In the east and the northeast, distribution of rain was disrupted first by cyclone Mora in the end of May and then by the formation of upper air cyclonic circulation in June which interfered with the progress of the monsoon. Jharkhand, West Bengal and Odisha have already faced uncharacteristic long dry spells. “Because of the long gap between rains, crops faced water stress. Short-term crops, like moong, udid and soybean, were stunted. Their vegetative phase would be cut short and they will go into early flowering, leading to a drop in yield,” says Mohan Gojamgunde, agriculture officer of Latur. Depending on if, and when, rains resume, there may be a 15-50 per cent loss in kharif yield in Latur. The situation may not be much different in other parts of Marathwada and Vidarbha. In the neighbouring Madhya Pradesh, Shubham Patidar, 25, of Dhamnour village in Ratlam district, is staking all his saving into replanting the crops. Encouraged by the early rain, he sowed soybean in his 5-hectare (ha) farmland. But a three-week dry spell in June-July had a devastating effect. “I had to remove crops in at least 2 ha and sow again,” says Patidar. “There are many like me who are replanting,” he adds. There are reports from western Odisha that the first sowing has been completely damaged, although no government assessment was issued till the magazine went to print. Gurbaru Jued of Mudosil village in Nuapada district had sown paddy in 1.2 ha, but over 60 per cent of the seeds did not germinate. “There was no rain for over 10 days after mid-June,” says Jued. More than 50 per cent of the farmers in the block have suffered losses. In the first week of June, it rained so much that farmers followed the IMD advisory to sow early. But till July 18 (one-and-a-half month into the monsoon), the district was 36 per cent rain deficit. “Transplantation has been done in only 45-50 ha of 66,505 ha farms under paddy,” says Umesh Chandra Dash, deputy director, agriculture, Nuapada. As it emerges, farmers have been skipping transplant due to such frequent dry spells. “Uncertain rain has forced farmers to go for direct seed sowing because dry spell causes delay in transplantation,” adds Dash. Last year, 70 per cent of farms in the district adopted direct seeding. This year in Khariar and Boden blocks, the figure has gone up to 83 per cent. The focus has now shifted to whether the farmers will be compensated for the crop loss. PMFBY has provisions to compensate those who fail to sow crops and those whose sown crops get affected. But the procedure and technicalities make the scheme cumbersome. In Madhya Pradesh, farmers are making frenetic trips to banks to gather information about compensation. “Bank officials say our premium would be deducted after August 15. It means we are not covered for the current losses,” claims Patidar. According to the PMFBY rules, if 75 per cent of crop sowing has been impacted in a notified crop area, or if sowing has failed, then insured farmers would get 25 per cent of the total insured sum immediately. The remaining losses would be paid post loss assessment. But it is up to the state government to decide the types of crops covered under the scheme and to notify crop areas. According to an official of the Agriculture Insurance Company of India Limited, who did not want to be named, in the last rabi season, farmers in only two districts of Tamil Nadu got 25 per cent of the insured sum after their sowing failed. To benefit from PMFBY, a farmer has to first buy an insurance policy. But it appears that insurance companies are not too inclined to sell policies to farmers. In Harda district of Madhya Pradesh, the UCO Bank has not deducted insurance premium from farmers since the sowing of soybean started on June 1. The last date of premium deduction was 31 July, but it was extended to August 15 in the wake of deficit rain. “Without deducting premium, how can a company compensate?” asks Ram Inania, a Harda-based farmer. Mallika Arjun Rao, manager, UCO Bank, Harda, says farmers insure an expensive crop and then cultivate a cheaper one to later claim insurance and make profits. This is the real technical issue, not deduction of premium, she adds. “It is true that we didn’t deduct premium. But we will do by August 15,” says Rao. This means farmers who have lost crops due to the three-week dry spell would not get insurance coverage. V M Singh, a farmer leader and convener of Rashtriya Kisan Mazdoor Sanghthan, says, “In 2015, the Allahabad High Court ordered government to compensate farmers, irrespective of whether the premium has been deducted or not.” Singh had filed the case in 2015 with regard to the government’s earlier crop insurance schemes. Similarly, the Odisha government has yet not declared the date of insurance coverage. “Payment of premium for insurance was started on July 15 last year. This year, it is yet to start. We don’t know why it is delayed,” says Jued. For farmers such as him, the future remains uncertain. They have no option, but to invest again and replant. With the weather getting increasingly unpredictable, the importance of a farmer-friendly crop insurance scheme cannot be overemphasised. It has been more than a year-long chase for Ramnivas, who believed Prime Minister Narendra Modi when he introduced the Pradhan Mantri Fasal Bima Yojana (PMFBY) as the “solution to problems the farmers face” in April 2016. 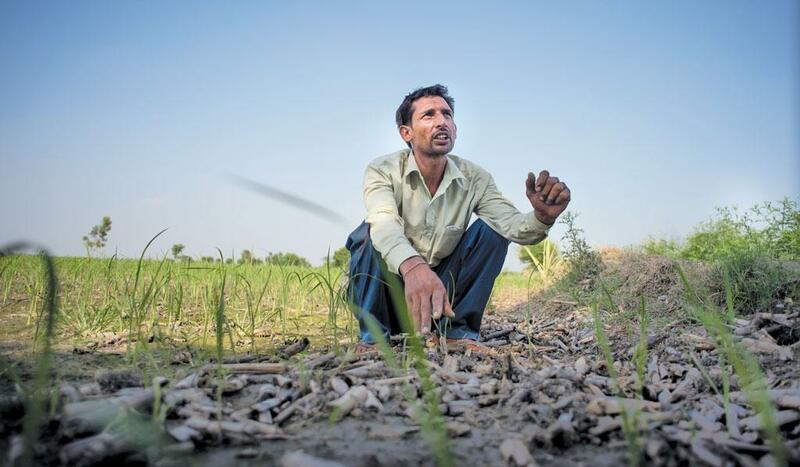 “I had heard the speech days after I had lost my entire wheat crop due to unseasonal rains,” says the young farmer from Kohla village in Sonipat district of Haryana. Excited, he immediately visited the bank to inquire about the scheme that was started in the kharif season of 2016. He later enrolled for the scheme when he took a loan for growing paddy in his 4-hectare (ha) farm. “Confident of the scheme, I was initially not worried when I lost almost 75 per cent of my paddy crop due to untimely rains during kharif 2016. I am worried now because kharif 2017 has started and I still do not know when I am getting the money,” says he. Like Ramnivas, many farmers across the country are losing trust due to the poor implementation of the much-desired crop insurance scheme, which replaces the National Agricultural Insurance Scheme (NAIS) and Modified National Agricultural Insurance Scheme (MNAIS). Picture this: none of the farmers from Ramnivas’ village has received the insurance money. They say they have tried everything—approached the bank, lodged formal complaints with the agriculture department, and even protested—and failed. PMFBY operates on an area-based approach, where a village or an equivalent area is considered as a basic insurance unit. At the start of each cropping season, the state government is supposed to release a notification with the threshold yield of individual crops in each insurance unit, which is calculated based on the average yield of the past seven years. The notification should also mention the sum insured amount for individual crops in respective insurance units. To assess crop loss, a team, consisting officials from the state agriculture department and the local insurance company, should visit four fields, randomly selected using a sampling method, and conduct crop cutting experiments (CCE), where a small portion of the field is identified and the crop in that area is harvested to ascertain the yield of that season. Depending on their assessment, all farmers enrolled under the scheme in the insurance unit will either get the compensation or not. The scheme has three levels of indemnity (protection against a loss)—70, 80 and 90 per cent. None of the farmers Down To Earth spoke to was aware of how the scheme operated, which highlights the poor awareness levels. After learning about the process, farmers started inquiring among themselves if any farm was visited by agriculture department officials recently. They even took out the list of the farms that government records claim were visited in the village. Surprisingly, the farmers on the list said officials only visited their farm during the cropping season and spoke to them to approximate the estimated crop yields. But not a single official visited at the time of harvesting to carry out the mandatory CCE. “Much before the harvesting season, an agriculture department official asked about the estimated paddy yield in my field. He made me sign some papers and said he will return during the harvesting season. But no one came,” says Sandeep Singh, one of the farmers from the Kohla village whose farm was in the list of CCE. In kharif 2016, Sandeep had sown paddy crop in three ha land for which he had taken a loan of Rs 3 lakh. As opposed to the average 55 quintals per ha of paddy he normally receives, this season, he managed just 10 quintals per ha. “In kharif 2016, I incurred a loss of Rs 2.97 lakh. I will not get a rupee because the local officials did not visit during the harvesting period,” says he. “Farmers in almost all the villages in Gohana have confirmed CCEs were not conducted during the harvesting period. Officials simply ask the yield of the crops from some farmers instead of conducting the actual experiments in the field,” says Satyawan Narwal, a farmer leader from Sonipat district. A Haryana agriculture department official also confirmed that the mandatory CCEs were not carried out at some places because the scheme had increased the department’s workload. His claim was verified by an insurance company official who said approximately 3,500 CCEs have to be carried out in a Haryana district for the complete coverage, but only 40-50 per cent are being conducted on the ground. “During the peak crop harvesting period of 10-12 days, 200-300 CCEs have to be carried out every day in each district. This requires huge manpower, which is not available,” says the insurance company official. In fact, officials in the Haryana agriculture development department had gone on strike to protest against the burden on them to conduct massive numbers of CCEs in September 2016. The agriculture department official says the department has even tried hiring people on contract to conduct CCE during the peak season, but it did not work because most of them did not have smartphones that are mandatory for the filming of CCEs, as per the guidelines. Even the recently released Pradhan Mantri Fasal Bima Yojana: An Assessment report by Delhi-based non-profit Centre for Science and Environment (CSE) says insurance companies lack the manpower and infrastructure to effectively carry out the scheme in rural areas. Insurance companies, especially private companies, have no functional office in tehsils and no agents are deployed at the block level, despite provision for it under the scheme. The report says that cases have been found across the country where the insurance company did not investigate the losses and therefore did not pay for the claims. Highlighting the casual approach of the officials, the report says in drought-hit Tamil Nadu, CCEs were conducted at the block or district level instead of the revenue village level for kharif 2016. No wonder, 14 of the 21 states had unsettled claim cases till April 2017, even though all claims should have been settled within three weeks after January 31, 2017—the date of receiving CCE yield data by insurance companies. In fact, over 68 per cent of the total claims had not been settled till April 2017 (see ‘Low on benefits’,). Brothers Deepak and Sachin from the Garhi Pukhta village in Uttar Pradesh’s Shamli district highlight another problem when they say that while the premium is collected by the bank officials, claims are handled by the insurance company. The brothers lost 90 per cent of their paddy crop in kharif 2016. “No body from the insurance company ever visited our village and we could not even get through to the insurance company,” says Deepak. Farmers from the village also say that a person had recently visited them and collected Rs 1,000 each from all the affected farmers on the promise of getting the insurance money. The CSE analysis says, “There seems to be a clear lack of coordination between banks, insurance companies and nodal government departments. There is also poor coordination regarding grievance redressal.” The PMFBY guidelines say every insurance company should have a grievance redressal system including a helpline number. “But these systems are non- existent at the local level. Currently, it is very unlikely that majority of farmers will be able to file complaints in case of any grievances,” says the report. Farmers also allege that banks have insured crops that are different from the crops they have actually grown on their field. 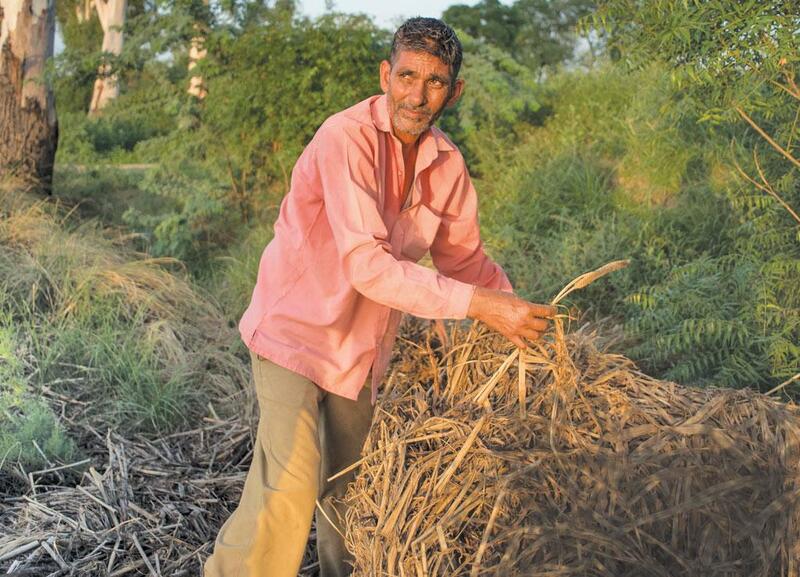 Sandeep Malik, sarpanch of Chhichdana village of Sonipat, says most farmers in his village had sugarcane crop in their field, but the premium was deducted under other crops. The CSE report says there are also several instances where the premium was deducted by banks for non-notified crops. The report also highlights farmers who have taken loans both from a bank and a cooperative have been charged insurance premium twice for the same crop. Insurance for the wrong crop effectively means paying a premium without any insurance cover, something farmers from Badheri village of Haryana learnt the hard way. Badheri farmer Ishwar Singh says he grew cotton and bajra in kharif 2016, but his insurance premium was deducted for paddy. 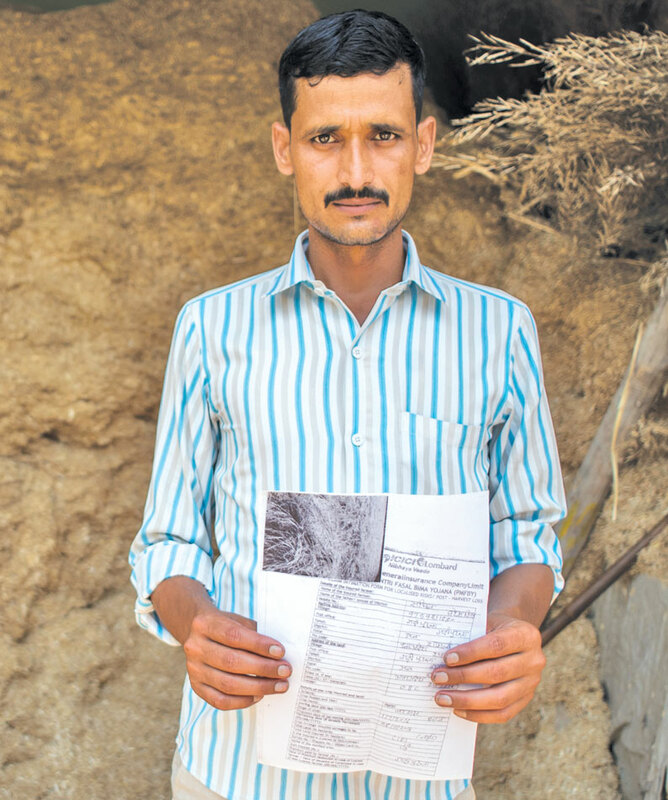 “I incurred a loss of Rs 2 lakh in kharif 2016, but my claim was rejected on the grounds that my field was insured only for growing paddy,” says Ishwar. He adds that when he asked the bank officials why paddy was filled in the insurance form, they said the detail was picked up from his Kisan Credit Card, in which the details were filled up several years ago. So how can the banks deduct the premium without the knowledge of the farmers? This is possible because when a farmer takes a loan, the bank automatically deducts the premium and enrols the farmer for the scheme. However, the bank does not give the farmer a separate premium receipt or a policy document. Instead, the amount is just mentioned in the passbook and as a result goes unnoticed. “Farmers usually are not even aware if their premiums have been deducted and crops insured. Premium deduction by banks without informing the farmer is a huge concern,” cautions the CSE report. The performance of the scheme is equally bad when it comes to dealing with individual claims. PMFBY has a special provision to cover individual farms from “localised calamities” which include hailstorms, landslides or inundation. Paddy farmers from three Haryana villages—Brahmanwas, Ghamar, Makrauli Kalan—say that despite informing the bank of inundation within the mandatory 48 hours after the incident, not a single farm was inspected. An official with the Oriental Bank of Commerce branch in Brahmanwas says the problem is with the insurance company, which has failed to send an assessor despite repeated reminders. The CSE analysis highlights major lacunae at the state-level implementation of the scheme. Several states released their PMFBY notifications well after the sowing season in kharif 2016. Banks, therefore, started deducting premium in the middle of the sowing season. As per the scheme’s guidelines, there should be a gap of at least one month between the release of the state notification and the risk inception date. For example, the date of premium deduction by banks (August–September 2016) in Haryana was after the date of kharif crop sowing (June 2016). Similarly, the normal sowing period for kharif in Madhya Pradesh is June-July, but most premiums were deducted in August 2016. Even Bihar and Gujarat issued PMFBY notifications in the middle of July. The delayed notifications meant that farmers could not avail claims for losses due to prevented sowing, caused by deficit rainfall or adverse seasonal conditions, which is covered under the scheme. The scheme also covers farmers from losses to standing crop and post-harvest losses up to a period of 14 days. States like Gujarat, Himachal Pradesh, Rajasthan, Tamil Nadu and Uttar Pradesh also did not mention the mandatory threshold yield in their notifications. In the states where threshold yields were released, the estimates were lower than the actual average. As per the Haryana PMFBY notification 2016-17, the threshold yield of cotton in Sonipat was just 4.43 quintal/ha. But Narwal says the actual cotton average yield in the area is 25 quintal/ha. “This means even if 80 per cent cotton crop of a farmer in Sonipat gets damaged, he will not get a claim,” says Narwal (see ‘Cost ineffective’). Another reason for delays in the claim process is that several state governments are yet to pay their premium to the insurance companies. Under the scheme, the farmers will pay two per cent of the value of the sum insured for all kharif crops and the remaining will be equally shared between the Centre and the state governments. But state governments in Tripura, Meghalaya and Bihar had not even started paying their share of the premium for kharif 2016 till April 2017. Another 11 state governments—Andhra Pradesh, Chhattisgarh, Gujarat, Himachal Pradesh, Jharkhand, Madhya Pradesh, Maharashtra, Odisha, Rajasthan, Tamil Nadu and Telangana—had made partial payments till April 2017, says the CSE report. Poor implementation is not just where the story ends. Farmer leaders also doubt the Centre’s claim that the scheme has been a great hit among farmers. As per the Ministry of Agriculture & Farmer’s Welfare, the enrolment numbers under PMFBY was over 30 per cent higher than the combined enrolment figures of the two crop insurance schemes it replaces. Crops of over 40 million farmers were insured during kharif 2016, up from 30.9 million farmers during kharif 2015. Even though the overall area insured increased by about 16 per cent between kharif 2015 and 2016, the average area insured per farmer reduced by 11 per cent. One of the reasons for the lowering average area insured could be higher enrolment by small and marginal farmers in the scheme. The reason for this seems to be that small farmers are taking loans and hence are getting covered under the mandatory insurance coverage. The Centre’s recent claim of a six-fold jump in the coverage of non-loanee farmers from kharif 2015 to Kharif 2016 is “bit of a stretch”, says Chandra Bhushan, deputy director general, CSE. “If we exclude Maharashtra and West Bengal data, then there is virtually no increase in non-loanee farmers. The percentage of non-loanee farmers availing insurance remained less than 5 per cent during kharif 2016 and kharif 2015,” says the report. So who is the scheme really helping? The insurance companies, say farmer leaders. For starters, the insurance companies are charging exorbitant actuarial premium rate. The CSE report says during kharif 2016, the all-India actuarial premium rate was 12.6 per cent, which is the highest ever charged under a crop insurance scheme in the country. In contrast, the average actuarial premium rate for kharif season under MNAIS has historically been 9-11.5 per cent. In Gujarat, the actuarial premium rate during kharif 2016 was 20.5 per cent. Rajasthan and Maharashtra charged 19.9 and 18.9 per cent as the actuarial premium rates. Highlighting the absurdity of the premium, the CSE report says the actuarial premium rate for growing tur daal in Madhya Pradesh’s Umariya district was 40 per cent during kharif 2016. The premium rate for gram in the state’s Agar Malwa district was 35 per cent. No wonder, most insurance companies are making huge profits. As per data released by the Insurance Regulatory and Development Authority of India, PMFBY played a significant role in the growth of non-life insurance industry in 2016–17. The gross direct premium of general insurance companies grew by 32 per cent, from Rs 96,376 crore in 2015–16 to Rs 1.27 lakh crore in 2016–17. Nearly half of this growth came from crop insurance. CSE analysis indicates that during kharif 2016, companies made close to Rs 10,000 crore as profits. This is not actual profit, as administrative and marketing charges and taxes have to be subtracted from this amount. “Private insurance company will only try to maximise profits and will not try to honour most claims,” says Sudhir Panwar, a former member of the planning commission in Uttar Pradesh. 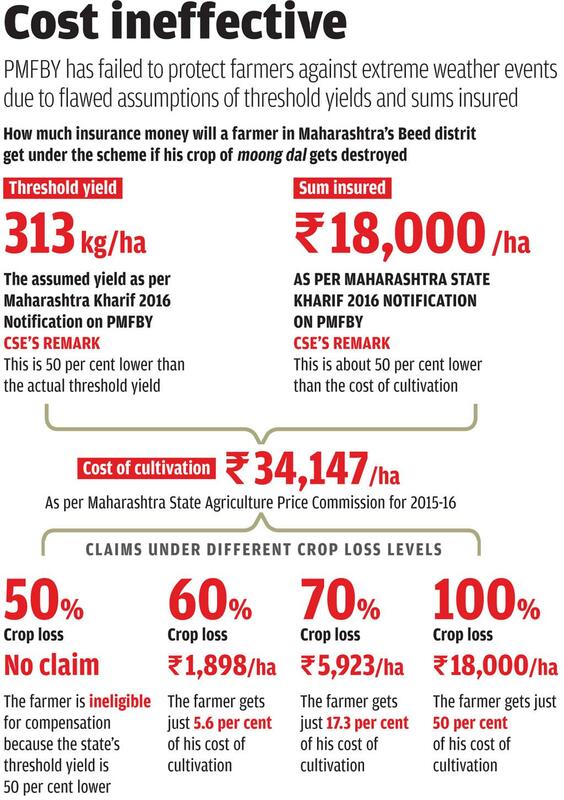 Interestingly, the guidelines have a provision where the Centre will pay the claims to protect the insurance companies, if the premium-to-claim ratio at the national level in a crop season exceeds 1:3.5, or percentage of claims to the sum insured exceeds 35 per cent. The guidelines, however, have no mechanism for companies to share profits with the farmers or the government. “So, under PMFBY, profit is private but liability is public,” says Bhushan. Despite the issues, the scheme has potential and is a definite improvement over the two schemes it replaces. However, several tweaks are needed before it can fulfil the prime minister’s vision of safeguarding every farmer in the country. To begin with, the scheme should fulfil the provision of including tenant and sharecropper farmers. Additionally, potential yield figures should be used for crops for which historical average yield data is not available. The CSE report also says crop damage by wild animals, fire, cold waves and frost should also be included for individual-level insurance. For the operational problems, the report suggests greater sensitisation of farmers. It also calls for the involvement of panchayats in the insurance scheme, which will make the scheme’s implementation transparent and participatory. The government should also invest in digitising the information and provide regular updates for the public. The CSE report suggests that over time, the insurance unit should be reduced to individual farmers. State government should also ensure that the sum insured for all the crops should be equivalent to the scale of finance. This can be achieved by revising the threshold yields of various crops to match them with the actual produce. Finally, the existing grievance redressal mechanism needs to be strengthened and, if required, the government should monitor the toll-free helpline numbers insurance companies set up. The scheme has started on a bad note, but farmers need an effective insurance cover today more than ever, with news coming in that rains will remain below normal till the second week of August in central and southern India. Will the prime minister’s flagship scheme be able to deliver?